The 21st Century has, thus far, been a bumpy and oft-frustrating ride for lovers of Tim Burton’s highly idiosyncratic, Goth-tinged brand of misfit cinema, where emotionally and/or physically scarred outsiders undergo whimsical journeys in search of acceptance and comfort. Although the auteur’s delightful Gran Guignol take on Sweeney Todd was as queasily beautiful as a freshly-drawn gush of blood splatter upon immaculate white linen, and 2002’s Big Fish offered up a loving deconstruction of the art of storytelling, these intriguing ventures have been largely overshadowed by his more clunky, costly – and considerably more lucrative – blockbuster efforts, Planet of the Apes and Charlie and the Chocolate Factory. Certainly there are germs of wounded, bravura inventiveness to be mined within those unsatisfying misfires but there’s also a disturbingly perceptible feeling that the director’s once-potent formula for spinning poignant, weirdo spectacle has begun to unravel like Oogie Boogie’s potato-sack hide. 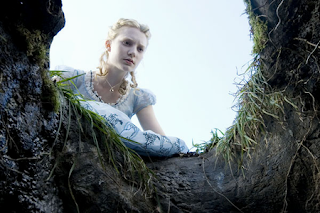 While Alice in Wonderland, a feverishly-designed blending of Burton’s off-beat artistic quirks and the bizarre imagination of Lewis Carroll, won’t exactly alleviate fans’ apprehensions, it’s a frequently fascinating technical achievement which masks its narrative inadequacies with enough visual bedazzlement to please those in search of unforgettable strange sights and rich landscapes. Tearing a page from Spielberg’s Hook, Burton reintroduces an older, more conflicted Alice (Mia Wasikowska – as spookily pale as any Burton heroine, wearing subtly dark eye-makeup and, eventually, an Avril Lavigne wardrobe), a 20-year-old Victorian dreamer who, convinced her childhood escapades were simply a vivid nightmare, once more takes a fateful header down the ol’ rabbit hole while escaping a ghastly engagement party. Befuddled and frightened, the plucky blonde quickly encounters her old peculiar playmates and becomes entangled in their plight, yearning to escape from under the tyrannical rule of the light-bulb-headed Red Queen (Helena Bonham Carter – fun as a screeching cartoon, but noticeably underwritten) and her gangly henchman, the Knave of Hearts (Crispin Glover). Burton handles these remarkably strong initial sections with carefully-measured humour and expertly orchestrated sequences of surrealistic marvel - particularly Alice’s lengthy plunge and protracted attempts, involving shrinking-potions and growing-cakes, to enter through a miniature door into Wonderlan d. Part of the irresistible charm of these early moments lies in the fact that they’re played with minimal dialogue and overwhelming sound, drawing us in and allowing us to share the heroine’s disorientation and naive curiosity. 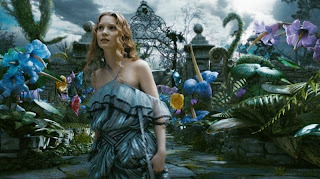 We’re genuinely astonished, and so is Mia Wasikowska, who truly shines as Alice, imparting her with restrained gutsiness, virtuousness and a mild rebellious streak (established during her very funny fumbling navigation through the lavish opening garden party) which provides the project with a strong grounding influence once the ornately-designed CG and frenetic characters burst into the picture. And, boy, do they ever! Tweedledee and Tweedledum (Matt Lucas), along with White Rabbit (Michael Sheen) and Dormouse (Barbara Windsor), are speedily introduced with little fanfare at all, a creative choice which won ’t bother many, but rather tested my own extremely vague memories of the monotonously episodic 1951 animated adaptation and its Disneyland ride counterpart, and may also leave younger viewers a tad perplexed. However, the movie quickly finds its footing with a pair of truly enchanting encounters, featuring the dignified Blue Caterpillar (Molasses-voiced Alan Rickman), who’s stateliness and wise words are enveloped within immense cloudy puffs of tobacco (?) 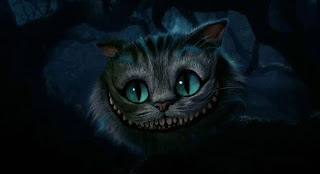 smoke, and the enigmatic Cheshire Cat (Stephen Fry), a fabulously-executed, hypnotic creation whose silky charms and graceful floating movements alone make the film worth seeing in digital 3D. 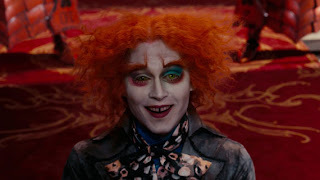 Oddly enough, Alice’s biggest stumbling block is its most ubiquitous selling point, which is the problematic Mad Hatter (Johnny Depp), a mincing, lisping dandy, who frequently speaks in an incomprehensible Scottish brogue (Has Depp been hanging around Mike Myers? ), and has be en upgraded from anarchic lunatic to eccentric freedom fighter with a tragic paper-thin backstory. Though his initial tea party appearance, alongside the hilarious March Hare (Paul Whitehouse), hits the right marks, once he begins to steer the film’s trajectory, pushing Alice towards helping restore reign to the benevolent White Queen (a beaming, fluttering Anne Hathaway), the story begins to sag and wobble. For, Hatter is too creepy to be heroic, too silly to be taken seriously, and wrapping Alice in Wonderland so tightly around him is a woeful miscalculation. He should have remained a colourful side-character and left the heavy-lifting to the charismatic Wasikowska. To his great credit, Burton masterfully slathers on spell-binding sight after spell-binding sight in order to distract from the film’s lack of propulsion in the middle-sections , and he’s actually reasonably successful. By the time Alice, sporting fetching shiny armour and swinging a mighty sword, faces off against the terrible Jabberwocky, and the eternal peace of Wonderland hangs in the balance, I was thoroughly immersed in Burton’s vision. 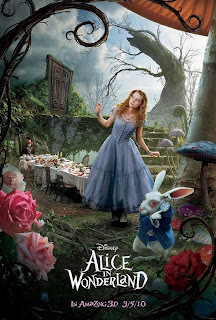 This Alice probably won’t wow Carroll diehards, or remain lodged in the average film-goers’ head for very long, but as an exercise in Tim Burton-ian movie magic, it often works wonders. *Originally printed in SFU's The Peak: March 15th, 2010.